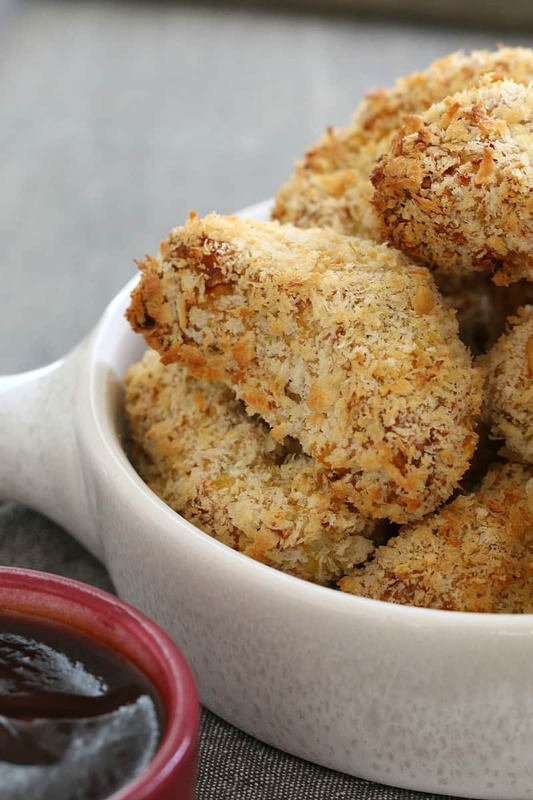 These deliciously healthy Chicken & Vegetable Nuggets are sure to be a hit with the whole family! Oven-baked to perfection… and totally freezer-friendly. 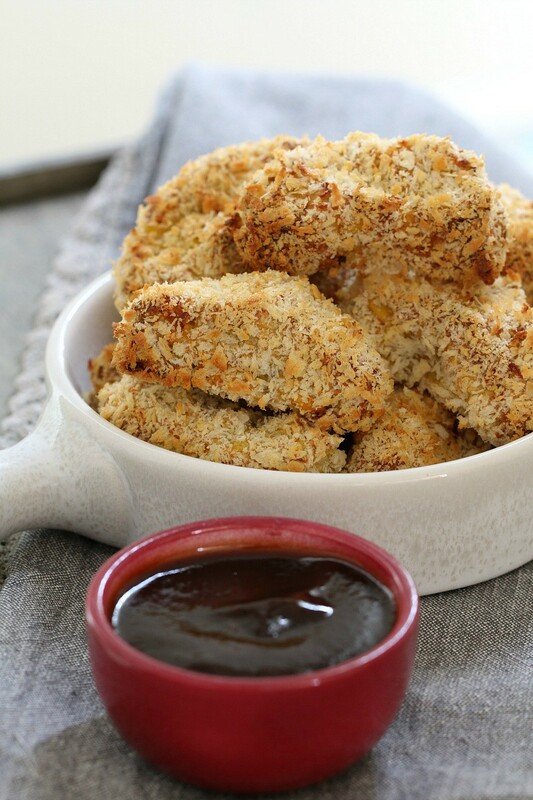 If you want a healthy alternative to a good old chicken nugget… this is the recipe for you! If you want to smuggle some vegetables into your kiddies meals… you’ve come to the right place! And hey, if you want some simple snacks that you can freeze and then reheat… HELLO… I’ve got you sorted! 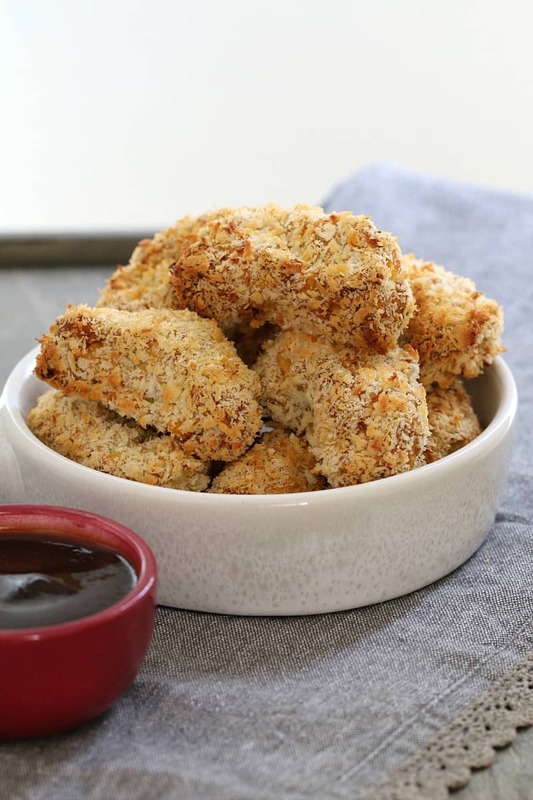 Yay – so let me tell you all about these yummy and healthy chicken & vegetable nuggets. At the moment, my little independent Mr 17-month-old Will is going through a stage where he only wants to feed himself. Which is great and I’m all for him doing things himself… BUT some foods are really tricky for him to eat on his own (remind me to tell you the story about him trying to eat slippery little green peas one day… too funny!). Anyway, I’ve been trying to give him finger-food that is easy for him to eat independently – which brings me to these yummy nuggets. 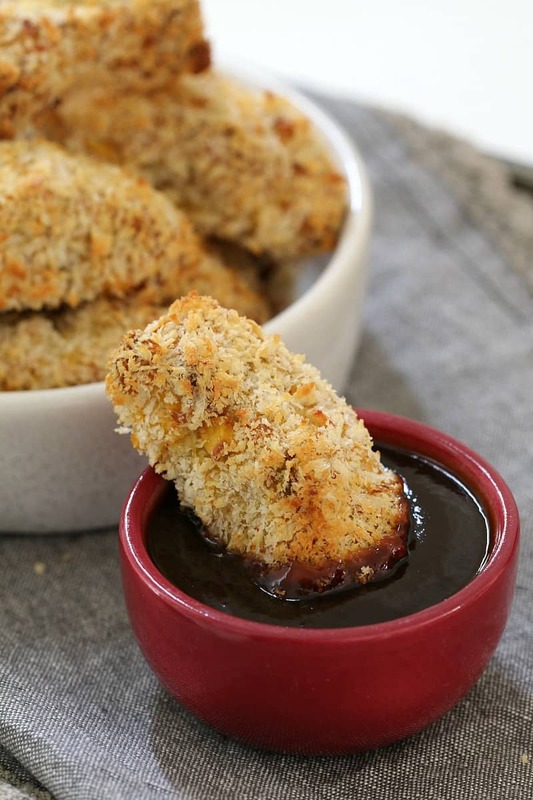 Aaaaaages ago, I shared my recipe for parmesan crumbed chicken nuggets (holy heck they’re good! ), but I thought it was about time I stepped up my homemade chicken nugget game and came up with a hidden vegetable version. These healthy chicken & vegetable nuggets have carrot, zucchini and corn hidden inside. And who doesn’t LOVE a few hidden vegetables! Plus they’re oven baked… so there’s no gross oily-ness going on. Uuurgh! The best thing about these nuggets is that you can make a big batch, cook them and then pop them in the freezer. When you need some, just grab them out and reheat. Easy. Peasy. I’m loving the whole freezer-friendly thing at the moment, mainly because Will isn’t a huge eater and so I can just grab 1 out at a time. 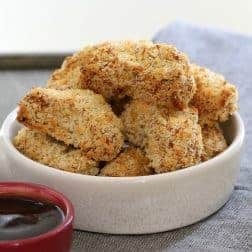 While these nuggets make the perfect finger food for the littlest ones in your house, they’re also great for school lunch boxes or a weekend treat. Ohhhh and do not for a second think that these healthy chicken & vegetable nuggets are just for the kids. HECK NO!! These are definitely also for your fine self. 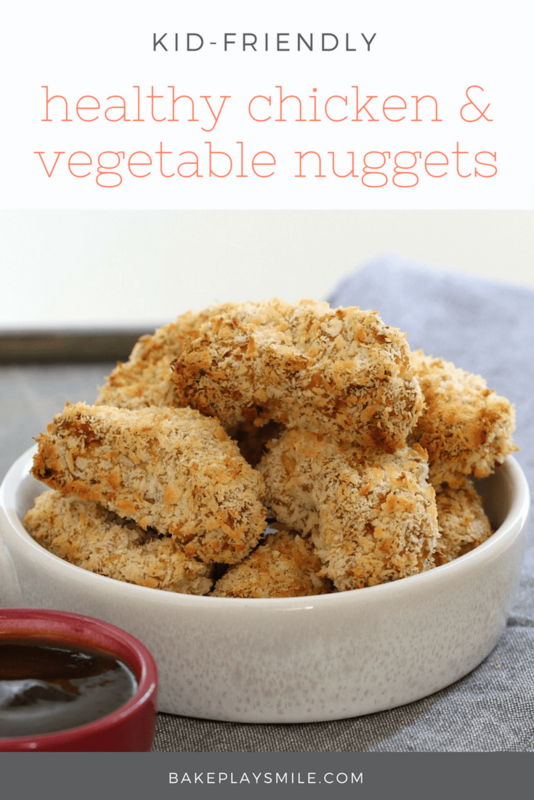 These deliciously healthy Chicken & Vegetable Nuggets are sure to be a hit with the whole family! Oven-baked to perfection... and totally freezer-friendly. Line 2 baking trays with baking paper and set aside. Place the grated zucchini and carrot into a sieve and strain out any excess liquid. Place the strained vegetables into a large mixing bowl. Add the strained corn kernels, chicken breast mince, dried breadcrumbs, chicken stock powder and the egg and mix well to combine. Take tablespoon-sized portions of the mixture and form into a nugget shape. Coat with the panko crumbs and place onto the baking trays. Spray the chicken and vegetable nuggets with cooking spray. Bake for 30 minutes or until cooked through. These chicken and vegetable nuggets can be frozen after cooking. 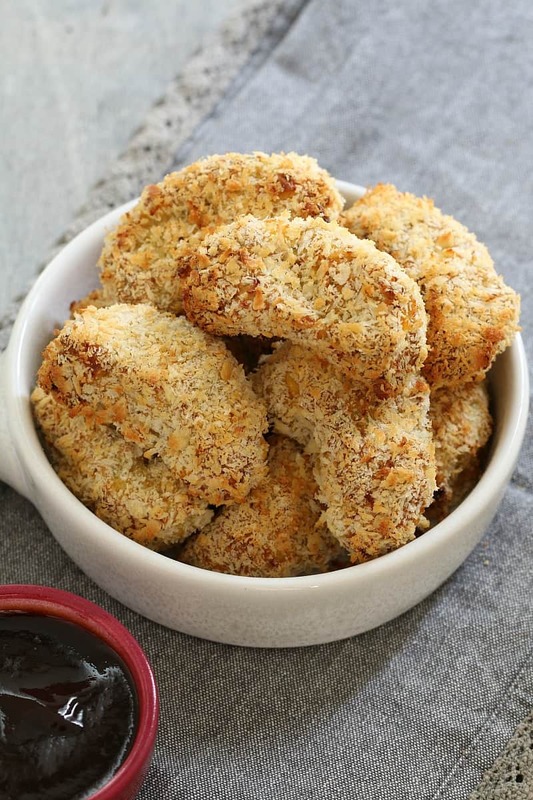 These deliciously healthy Thermomix Chicken & Vegetable Nuggets are sure to be a hit with the whole family! Oven-baked to perfection... and totally freezer-friendly. Place the zucchini and carrot into the Thermomix bowl. Press Turbo 5-10 times, or until finely grated (you'll need to scrape down the sides of the bowl a couple of times). Place the grated zucchini and carrot into a sieve and strain out any excess liquid. Place the strained vegetables back into the Thermomix bowl. Add the strained corn kernels, chicken breast mince, dried breadcrumbs, chicken stock powder and the egg and mix on Reverse Speed 4, 20 seconds, or until completely combined (you'll need to use the spatula to assist with mixing). Hahaha that is very true! I just love all the recipes, when you get to my age you just want quick and healthy small meals. Being able to freez them is also a plus. Thank you. These are perfect then!! I freeze them in a container and then just take 1 or 2 out for my little boy. So simple! 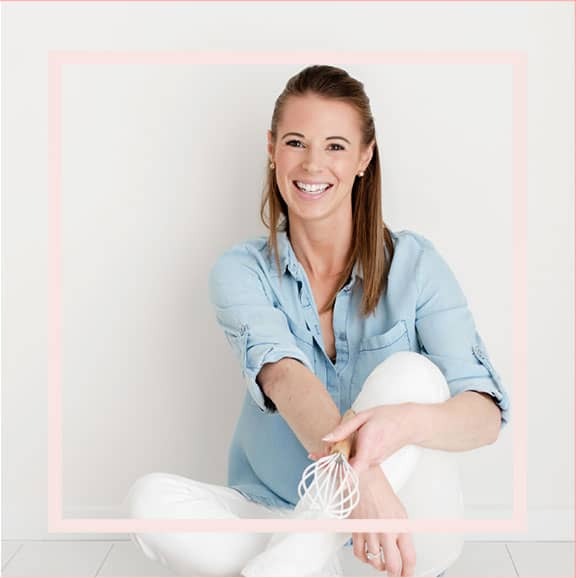 I’m so excited to welcome you to Bake Play Smile… this is my happy little blissful foodie paradise full of salted caramel goodness, chocolate-laden desserts and pretty much anything covered in sprinkles!